TheSheridanSun.ca is a weekly news website produced by the Journalism students at Sheridan College. Students manage the news website creating rich, original content. Students create videos,graphics, live blogs, multimedia stories and video casts. Sheridan’s 2-year undergraduate Journalism diploma program trains journalists to work in an ever-changing global media landscape. They’re tech-savvy storytellers who find and report the news using sounds, images and words, seamlessly weaving these elements together for a variety of platforms: websites, social media, newspapers, magazines, tablet, radio and television. Our newly renovated newsroom provides the best setting for a hands-on learning environment. This undergraduate program is for those students entering college from high school. A field placement/internship at the end of the second year of study provides further hands-on learning opportunities. Journalism-New Media-Graduate Studies is a 1-year program for graduates of university and college programs from diverse academic backgrounds, industry professionals seeking retraining, and/or those with substantial life experience seeking practical, hands-on training. 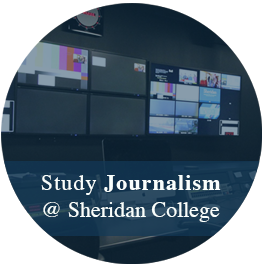 Sheridan’s Journalism-New Media program takes an integrated approach to learning by combining practical and technical training – fusing traditional journalism education with trailblazing technology courses. Student journalists work on a variety of platforms: websites, social media, newspapers, magazines, a tablet, radio and television in our newly renovated open concept newsroom. A field placement/internship opportunity is offered at the end of the second semester.